Pedestal Desks, Partners Desks, Computer Desks, Ladies Desks, Kneehole Desks, Captains Desks, Library Desks, School Desks, Writing Tables, Writing Bureaux and Filing Cabinets. from desks made in the 1950’s – 1930’s, Art Deco Desks, Antique Edwardian Desks, Victorian Antique Desks, Antique Partners Desks, Antique Library Tables and Antique Roll Top Desks. Refurbished Second Hand Reproduction Mahogany and Yew wood Desks, Filing Cabinets, Bookcases and Traditional leather Swivel Chairs. We are specialists in hand made Traditional and Contemporary style Bookcases, all manufactured and polished in our own workshops. A large range of sizes. Open fronted with adjustable shelves, Traditional Cupboard Bookcases, Box File Bookcases, Corner Bookcases and Traditional Library style Bookcases. Bespoke Bookcases made to your sizes. Made to measure Classic Bespoke Studies, designed and fitted to your room in a range of polished wood finishes or painted colours. Traditional Wood Panelling, hand crafted and fitted directly onto the walls by our team of craftsman. Traditional home office study Reproduction Leather Swivel Desk chairs, all upholstered in our own workshops. Leather Captains Swivel Desk Chairs, Gainsborough Swivel Chairs, Court Swivel Chairs, Viscount Swivel Chairs, Ascot Swivel Chairs, Directors Swivel Chairs, Regency style Desk Chairs, plus Georgian and Queen Anne style Leather Wing Chairs, Chesterfield Club Chairs and Chesterfield sofa’s in a range of hide leather colours. Regency and Victorian Boardroom Dining Tables and Chairs, Display Cabinets, Corner Cabinets, Sideboards, TV Cabinets and Occasional Traditional English Reproduction Furniture. Wood finishes including Mahogany, Oak, Yew wood, Cherry wood and exclusive wood finishes, Burr Walnut, Burr Elm and Burr Oak, all hand finished in our own workshops. Painted Desks and Painted Bookcases also available. Traditional Desk Accessories, including Desk sets, letter racks, Hand made Desk Blotters. Filing Trays, Bookends, Box Files and Lever Arch Files. Brass Desk Lamps, Green shaded Bankers Lamps. 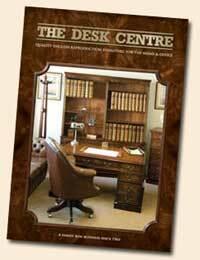 The Desk Centre UK – English Reproduction Furniture and Traditional Home Office Study furniture Specialists. Download our latest, detailed price lists as pdf files. For computer desks, click here. The Desk Centre. The UK’s leading suppliers of Traditional English Furniture for the Home, Study and Office. A smaller Independently run Family Business, trading since 1965. We still manufacture, polish and upholster all of our furniture here in the UK keeping delivery times low and offering a friendly, knowledgeable and personal service not often found in today's larger Furniture outlets. The largest choice of newly manufactured English Reproduction Study and Office furniture available in the UK.